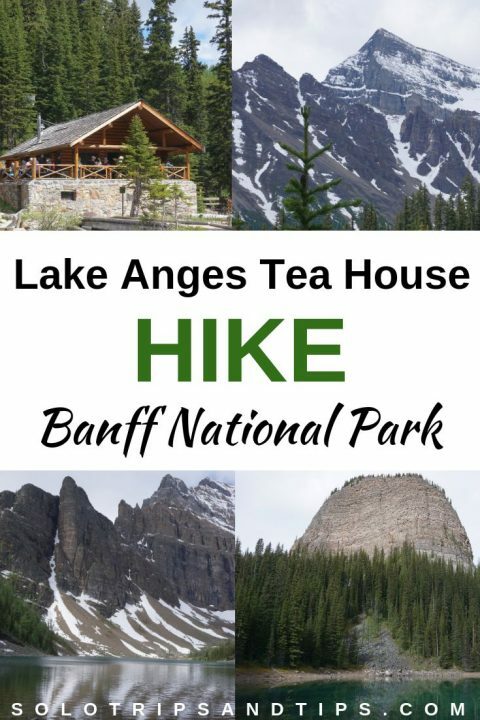 Enjoy a visit to Lake Louise in Banff National Park and a wonderful hike with a tea house at the summit. Really! 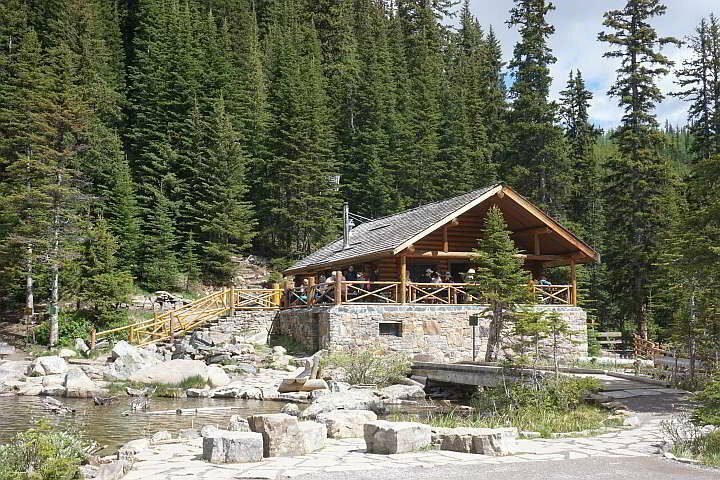 The Lake Agnes trailhead is accessed from Lake Louise and the tea house is your reward at the end of the hike. 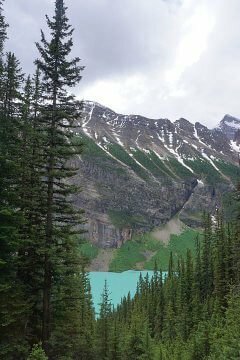 With amazing views of Lake Louise this is a perfect trail for solo hikers or a family outing in the Rockies. I can’t wait to do this hike again! In this post I’m sharing photos from my last trip to Lake Agnes plus all the info you need to enjoy this hike. I’m already getting excited about my road trip back to Alberta in May! This time, I’m driving all the way from Chattanooga Tennessee. 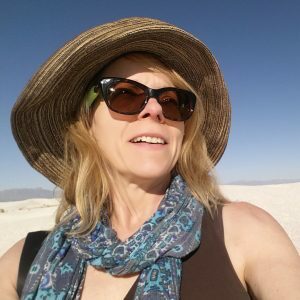 In 2018, I drove to Calgary from Lafayette Louisiana with stops in Yellowstone AND Glacier National Park – now that was an epic 2 week adventure! And then I got to visit both Banff and Jasper National Park in the summer AND Cape Breton Highlands plus Acadia National Park in the fall – I am so lucky and grateful for my location independent lifestyle. Lake Agnes was named after Lady Susan Agnes MacDonald, wife of Canada’s first Prime Minister Sir John A MacDonald, she visited the lake back in the 1800’s. You can park in the Lake Louise parking lot. Then walk past the Chateau Lake Louise, and walk around the right side of the lake about 200 m (1/8 mile) to the trailhead. Watch for the Lake Agnes sign on the right. During the summer the parking lot fills up quite early so plan on waiting for a spot or get there very early in the morning or go in the evening when most people are dining. 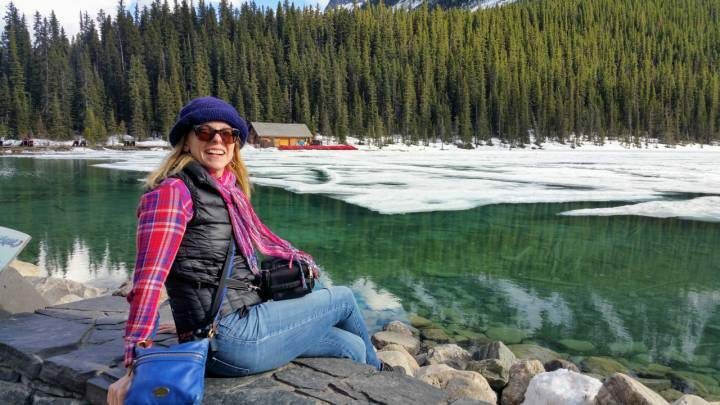 Did you know that Lake Louise is named after one of Queen Victoria’s daughters? But the Stoney Nakoda First Nations tribe called it Lake of the Little Fishes. 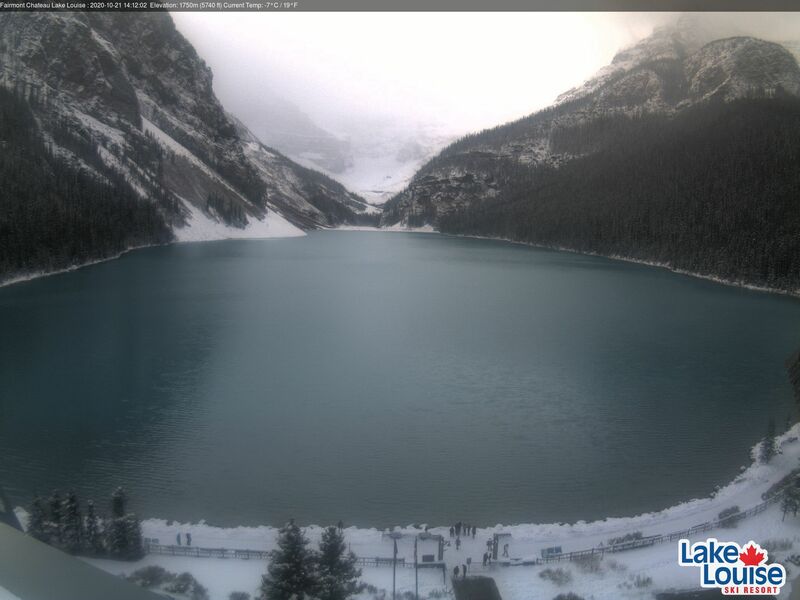 Parks Canada maintains a live webcam at Lake Louise – have a look here! As you can see there is still a lot of snow and Lake Louise is still frozen as of April. Soon enough the spring weather will bring warmer days in the Rockies, but remember it can snow any month of the year in the Rocky Mountains. Enjoy epic views of Lake Louise in Banff National Park while hiking the Lake Agnes Tea House trail. Along the trail you’ll also see Mirror Lake, a tiny glacier lake that does not look like Lake Louise at all. Sorry! 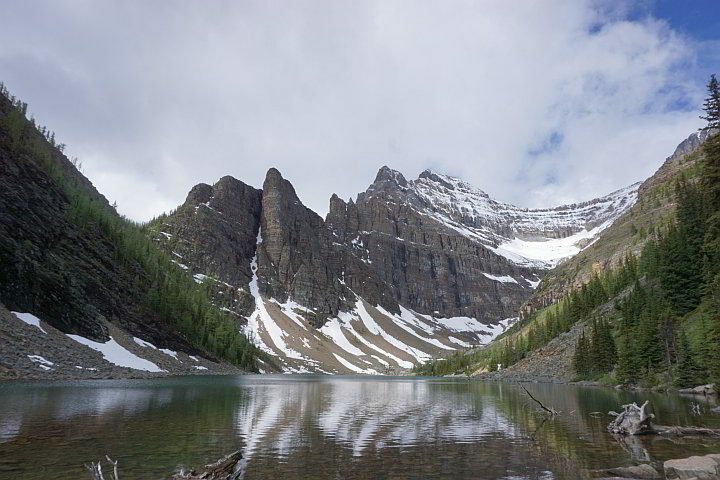 But Lake Agnes is a beautiful lake with Rocky Mountain views of Mount Niblock and Mount Whyte. 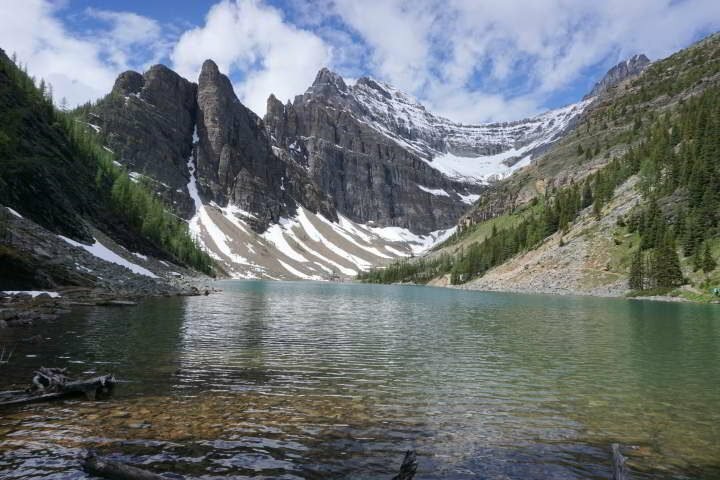 Lake Agnes Tea House Hike – this view of Lake Agnes and the Rocky Mountains is your reward! 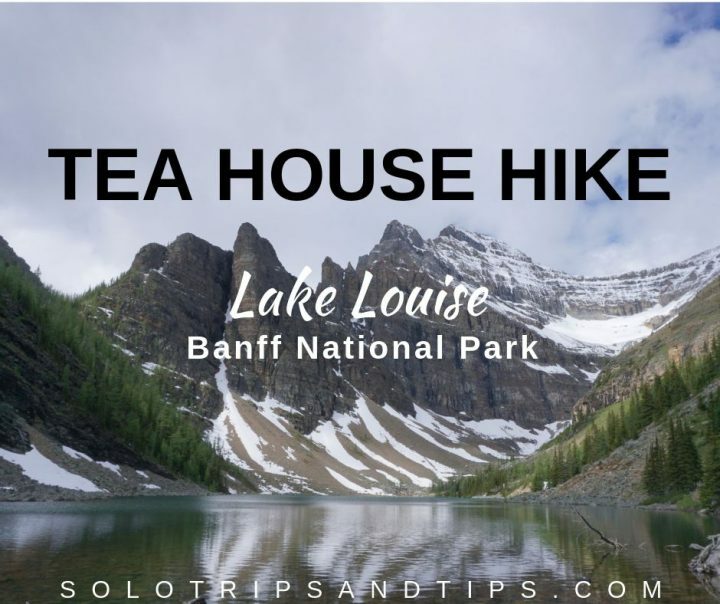 Partly due to easy access from Lake Louise, the tea house hike is one of the most popular hikes in Banff. It’s best to hike to Lake Agnes early in the day or try around dinner time to avoid the biggest crowds. 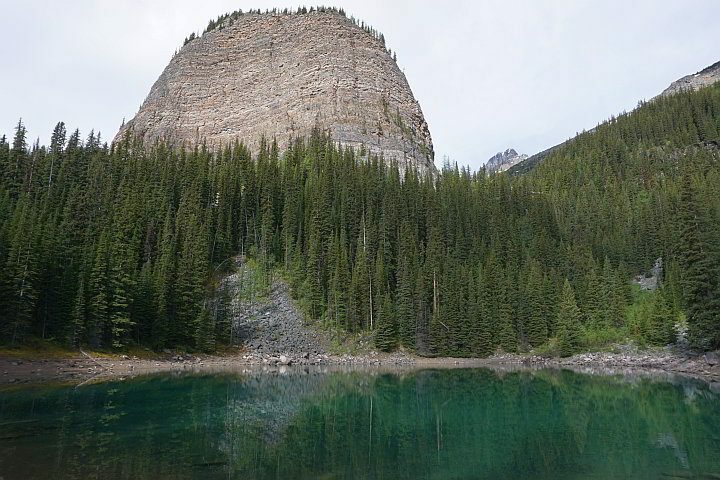 The days are long in the summer, so you have a lot of daylight hours to enjoy hiking around Lake Louise and Banff. In June the sunrise is around 5:30 and sunset not until about 10:00 – so you have almost 17 hours of daylight. Lake Agnes Tea hike difficulty rating is moderate, mostly due to the elevation gain. If you’re not used to hiking, you’ll probably want to take breaks along the way. Stop and enjoy the views and remember to keep hydrated, stopping for water breaks is important. Serving over 100 different types of loose leaf tea, Lake Agnes Tea House is bound to have your favorite cup of chai. They also serve soups, sandwiches, and desserts. Have a look at the menu here. Please note that Lake Agnes tea house does not accept credit or debit cards – cash only (Canadian or US currency) and apparently, they still take traveler’s checks. I’ll tell you right now, Lake Agnes Tea House is expensive! We paid $100 (CAD) for a pot of tea, sandwiches, and cookies for 3 people. They hike almost all their supplies up the mountain, so that’s part of why it’s so expensive. And Lake Louise one of the most popular tourist attractions in all of Canada, so there’s the popularity factor too. Traveling to Lake Louise on a budget? Bring your own picnic lunch and enjoy it with a view of the Rocky Mountains. That’s what I plan to do when I hike Lake Agnes again this summer. 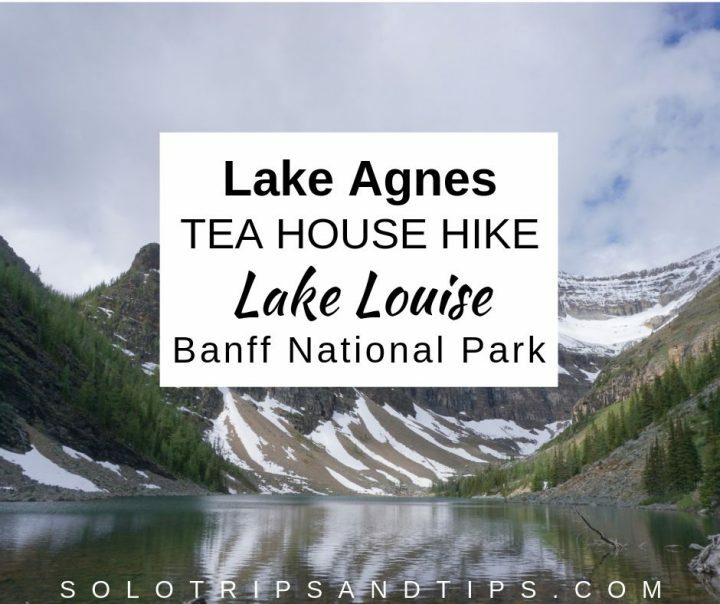 How long does it take to hike to Lake Agnes Tea House? Allow around 1 hour to 90 minutes to get to the tea house, and a little less on the way back down. Total hiking time 2 to 3 hours. What is the elevation gain? 400 m (1,300 ft) Remember, slow and steady wins the race. Hike at your own pace and stop if you need to rest. Drink water to stay hydrated. How difficult is Lake Agnes hike? This hike is rated as moderate. If you are in good shape you should have no problem doing this hike. If you are new to hiking or out of shape you’ll probably want to take frequent breaks. Bring water with you so you can keep hydrated while hiking. When is the best time of year to hike Lake Agnes? June through October. Are dogs allowed on the hiking trail? Yes Lake Agnes is dog friendly! But dogs must always be on leash. Facilities at trailhead? Chateau Lake Louise has several restaurants and of course bathrooms. Do I need to pay a fee to get into the park? Yes, visitors to Banff National Park must pay an entrance fee. There are various options from day passes to the Parks Canada Discovery Pass. You can check the rates and buy your pass online at Parks Canada. You can also pay when you enter the park. REMEMBER to Leave nothing but your footprints and take nothing but pictures! Please pack out any trash and recycling that you bring with you to the Lake Agnes tea hike. Staff at the tea house carry down the trash and recycling from the café. 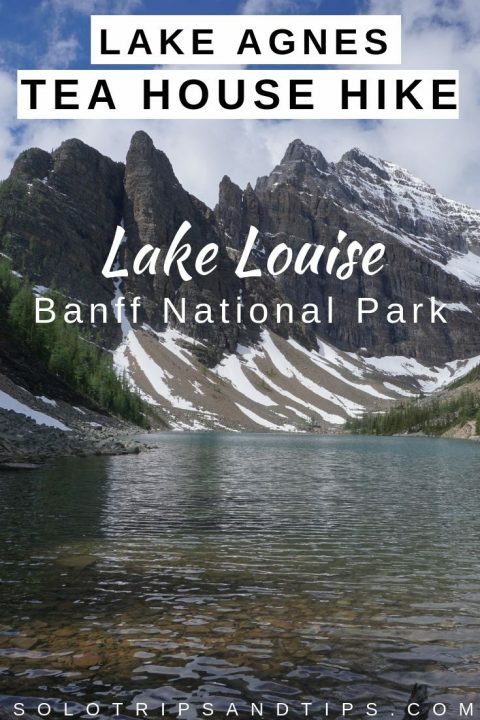 Have fun visiting Lake Louise and Banff National Park. 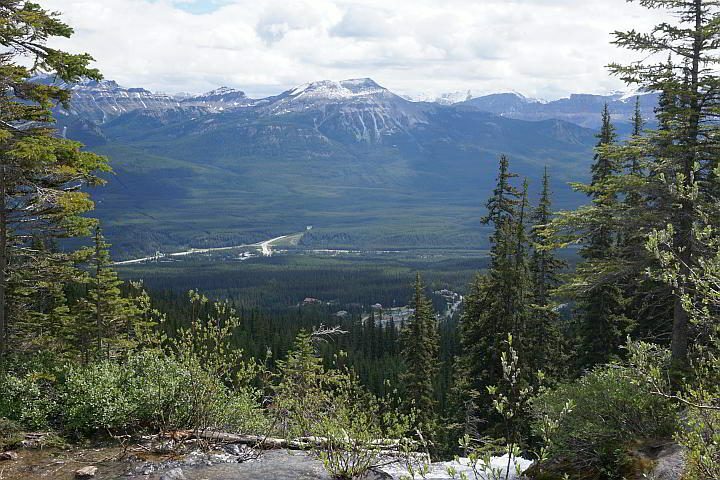 I hope you enjoy hiking in the Canadian Rockies as much as I do! Great post! And thanks for the tip that the tea house is quite expensive. I’d love to do this hike someday but will know to pack my own lunch :) Beautiful photos too. I had no idea Lake Agnes was so gorgeous! Though it shouldn’t surprise me as the Canadian Rockies are nothing but a continuation of gorgeous. 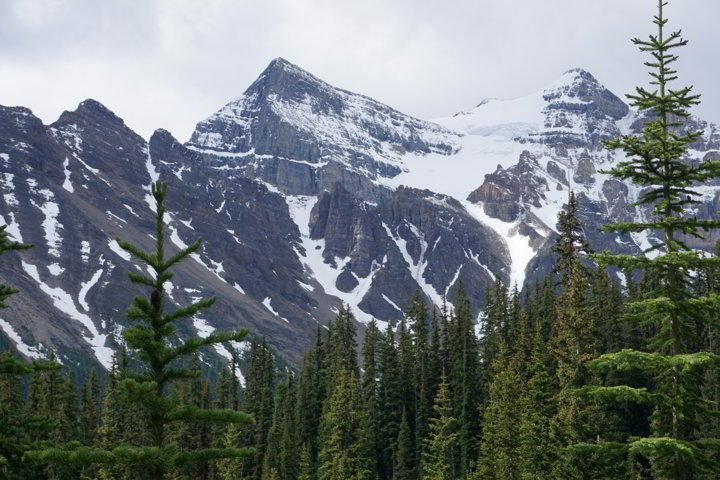 I hiked to the Plain of Six Glaciers Teahouse from Lake Louise. Coming back, I passed by the Beehive, but had nothing left in the tank to continue on to Lake Agnes. I’m sorry I missed it! April, There’s always next time! Plain of Six Glaciers is on my list for this summer! Wow that’s a great post and loved all the pictures. Hope to visit Lake Louise sometime. Thank you Madhu! So much beauty in the Rockies, can’t wait to get back, leaving in about 2 weeks for my road trip up to Canada!